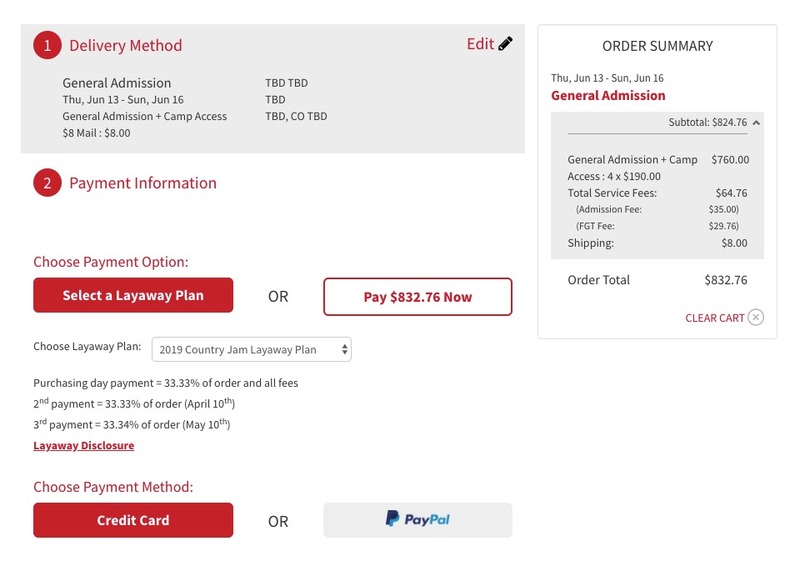 If you wish to pay for your tickets in increments instead of all at once please choose the “Layaway Plan” option when checking out in your shopping cart. This will break your total cost into monthly payments lasting over two months. There will be a $10 fee added for using the payment plan, but no interest is accrued. All fees will be processed on your first payment. After you’ve added the items you want to purchase to your cart, simply click the “Select a Layaway Plan” button during step #2 of the checkout process as shown below. If you choose to cancel at any point during the payment plan you will be charged a $75 cancelation fee, refunded the amount you have paid so far, and exempt from the remaining payments. Canceling will relinquish ownership of any seats or sites you have claimed and they will be available for others to purchase.